A golf day has raised more than £25,000 for a charity that supports people with a disability. The annual Brighton & Hove Albion Golf Day took place at the East Sussex National Resort and featured 17 teams, including a number of businesses, including Godfrey Investments, KSS, Penfold Verrall, BDO, and CCI Accountants. AITC works with more than 30,000 people each year and currently runs more than 60 different programmes – including 30 regular football sessions for people with a disability. One of its newest sessions is a fortnightly session for people with autism. It takes place at the American Express Elite Football Performance Centre and is proving increasingly-popular. To further build on the support the charity is able to provide to people with a disability, money raised from the golf day will now help fund a new multi-purpose and fully-accessible inclusion room at the Seagulls’ American Express Community Stadium. Once complete, the new facility will be used throughout the week by AITC and its participants, while on a matchday it will be transformed into a safe, welcoming and suitable environment from which Seagulls fans with autism can watch their heroes. Matt Dorn, AITC’s chief executive, was delighted with how the event went. He said: “We were once again overwhelmed by the support and generosity shown by the people taking part. 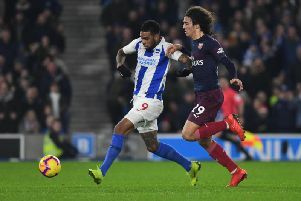 “Not only will the new facility at the stadium prove hugely-beneficial to AITC, it will also provide Albion fans who otherwise may not feel able to visit the Amex with the chance to attend matches and experience home games.